I’ve been getting a little frustrated with myself as of late as I feel I am a little lacking in the art department and when creating the graphics for project: Entrapment I had loads of trouble, but I feel as though this artwork for this bedroom scene has worked quite well and I must say that I am actually pleased with it. The main problem I had at the beginning was the perspective. when using one point perspective and then seeing what the character would look like walking around the room, I noticed that as he moved closer and further away from the screen, he seemed to shrink and grow respectively with regards to the perspective of the room. One way to solve this would be to use character scaling so that they get smaller as they move towards the back of the room. However I didn’t really want to do this as I wanted the character size to be consistent and also AGS’s character scaling feature looks a little… odd. In the end I used two point perspective, but with the two points close together near the centre of the room. I also had problems with lighting/shade. As I said earlier I feel as though I don’t have an artist’s eye and so had difficulty getting shadows and light to look right. I still don’t feel as though the lighting looks right in this image, but it will do. Let’s hope now that all of the other graphics go a lot smoother than this first one did. Okay, so I’ve begun my Second semester at University and for my Major Project, I have decided to work on my Adventure Game Drama: Entrapment. Last Semester I created the prototype, so now I’m working on the actual game and there’s a lot to do. Organization is a key factor when designing/creating a game and when looking at the Minecraft website I noticed that the creator ‘Notch’ had an online To Do list using the Toodledo website. I decided to sign up and create my own for Entrapment, which I am making public for anyone to view. Hopefully, this will help me keep organized with what needs to be done. Other than this I have been busy at work on the artwork such as the background Images and the animations for the player character. 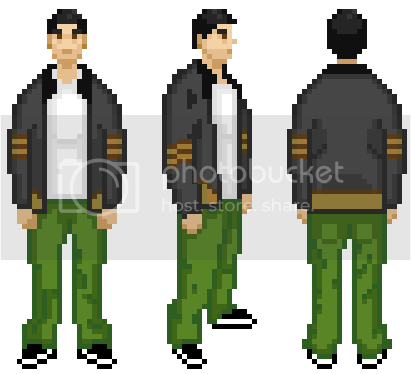 I still have a little work to do on the Backgrounds, but here are some attempts at sprites for the main player character. I think they are a lot better than the ones that were in the prototype! My main priorities right now are creating the backgrounds and working with the walking animations for the player character, so hopefully I will have an update on these soon.